The King Abdullah Sports City was always immense in its scale, hard to imagine if we only had the numbers, without actual satellite photos and design renderings. Complete surface of the complex planned in northern Jeddah is over 3,000,000 square meters! At the heart a huge stadium was planned, estimated at 100,000 capacity back in 2009. Should it get built, Saudi Arabia would have the world's second largest all-seater stadium. But Saudi authorities acted sensibly and decided it would have been perhaps 'unreasonable', seeing that attendances show absolutely no demand for such scale. That's why the final design revealed in 2011 saw the main stadium downscaled to 'just' 60,000 seats. Next to it an indoor hall for 10,000 spectators and several smaller sports grounds with luxurious infrastructure around. And forming a circle around the entire complex the largest parking site in Jeddah was planned. Actually, one of the largest around any stadium worldwide, at 25,000 bays. It turns out that one of Arab Peninsula's largest stadiums was built in 17 months overall, while vast majority was delivered this year with incredible pace. The speed-up that saw up to 8,000 workers on site working day and night a day was caused by the decision to relocate the 22nd Gulf Cup from Iraqi Basra to Saudi Arabia. And though today it's still not certain whether Jeddah will become the tournament's host stadium, it's most likely to happen as Saudi hosts did more than seemed possible in delivering the stadium. According to Arab News agency the stadium will be fully operable in 3 days. All seats are in place, audiovisual and lighting systems were tested. The grass is green not only on the main field, but also at secondary pitches outside the stadium. Highway hubs connecting the complex with central Jeddah from the east and west sides are also done. 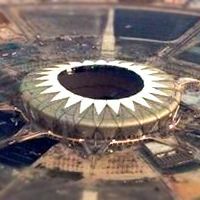 All indications say the first event at Saudi Arabia's second largest stadium will take place in around 2-3 weeks, in December.